Back in September I spent a day visiting a couple of Garden Conservancy Open Days Garden, one of which was Bird Haven Farm. 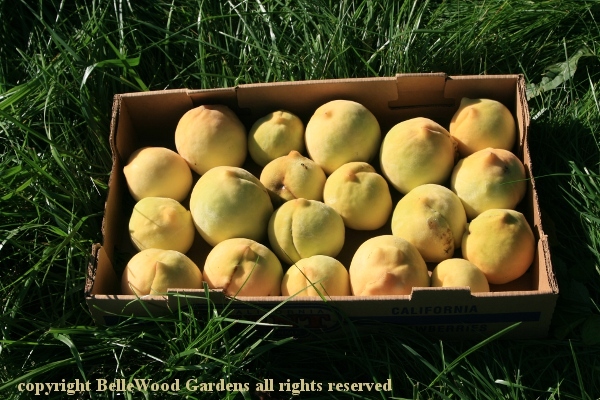 At the far end of the Upper Orchard I found some peach trees with hard green fruit still on them. They are 'Iron Mountain', an heirloom variety listed by the American Pomological Society in 1909. 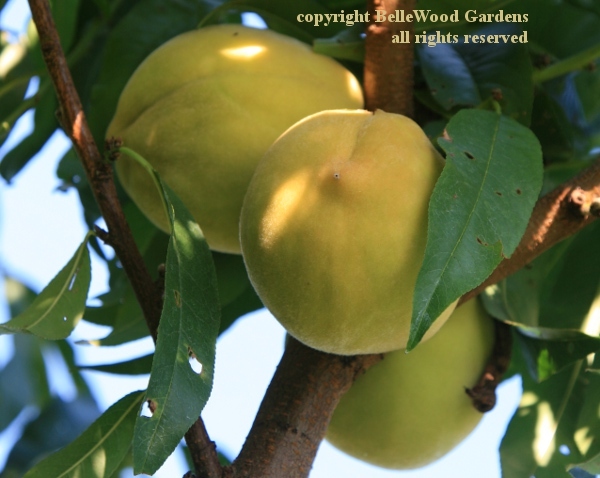 There's not much information on-line but what I did find informed me that this freestone peach, native to New Jersey, has pale green skin and greenish white flesh. It is said to be a bit dry, but incredibly sweet in a good year, and excellent for cooking. It matures in early October, very late for a peach. Fascinating! 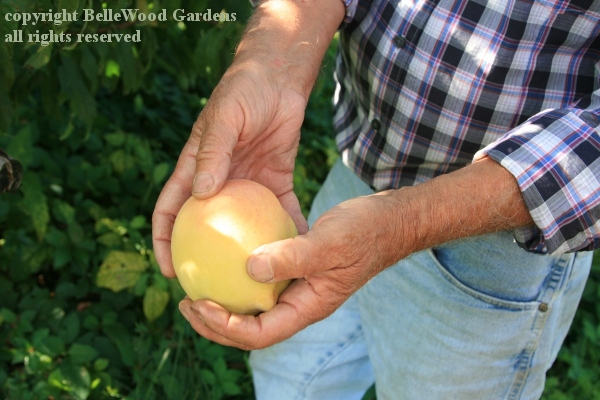 Then, just a few days ago when the garden club ladies were at the Rutgers Research Farm picking apples for the food bank, I asked Geoff about Iron Mountain peaches. "Oh yes,' he said, "we have them," "When are they ripe?" I asked. "Now." he said. So Sally and I followed him to the two trees and we both got some to take home. have a little pointy nubbin opposite from stem end. Fuzzy, greenish white skin, white fleshed, very delicate in that they bruise easily. Geoff thinks they taste like perfume. Paul thinks they're nice but not as good as the Saturn / white donut peaches that he adores. I pointed out that those are available in mid-summer and these are available now, and this is October! The trees are bearing well this year. he lead me back to the Iron Mountain peach trees to pick some more. I decided to make Iron Mountain peach butter infused with saffron. Saffron is a very costly spice. It is the dried stamens of the fall blooming saffron crocus, which is mostly cultivated in Iran, some from Spain and Italy, with efforts to develop it as a crop in Afghanistan. The thread-like stamens are picked by hand, then dried. 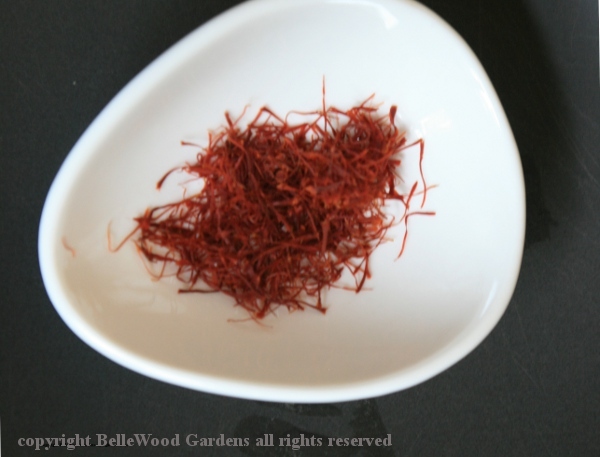 It takes about 150 flowers to yield 1 gram (0.035 oz) of dry saffron threads. 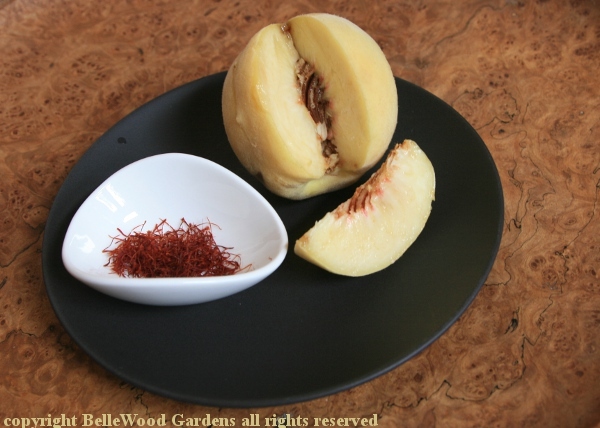 I used a three finger pinch from the saffron shown here to flavor 5 cups of Iron Mountain peach puree. I cut the peaches in large wedges, skin and all but pits removed. They were places, cut side up, in a shallow non-metallic pan, then roasted in a 350 degree Fahrenheit oven for 30 minutes. The peaches were then put through a food mill, peel and all. I added juice from 2 small limes, some sugar, and the pinch of saffron. After which the sweetened, flavored puree was refrigerated overnight. The next day it was put in a broad shallow Dutch over, brought to a brisk simmer over a medium heat. After which it went into a 225 degree oven for several hours until I judged the Iron Mountain peach butter was at a good consistency. Ladled into jars, sealed with 2-piece canning lids, and processed in a boiling water bath. Of course, I kept some aside for taste testing. Which received this jam lady's approval. Since Iron Mountain peaches are difficult to find I would think you could substitute other white peaches such as White Lady or a nectarine such as Sugar Giant.